Home Costs > How Much Does the Roomba Vacuum Cost? How Much Does the Roomba Vacuum Cost? Roomba is a brand of robotic vacuum cleaners that have grown in popularity ever since their introduction in 2002. Sold by iRobot, this series of autonomous robotic cleaning devices feature a full suite of sensors that enable seamless cleaning of clutter in any room, including spaces under the furniture. The cost of a Roomba vacuum depends on the model, features and capabilities. How much does a Roomba cost? On average, the cost of a Roomba will depend on the model, its condition and which retailer you purchase one from. The costs will range anywhere from as little as $350 for an older series to as much as $1,000 for a newer model. At the iRobot istore , for example, the newer units retail for $375 to $900. For example, the Roomba 650 retails for $375, while the 980 retails for $900. Roomba is made with a set of basic sensors that allow it to perform its tasks and a pair of wheels that work independently and enable 360° rotations in place. 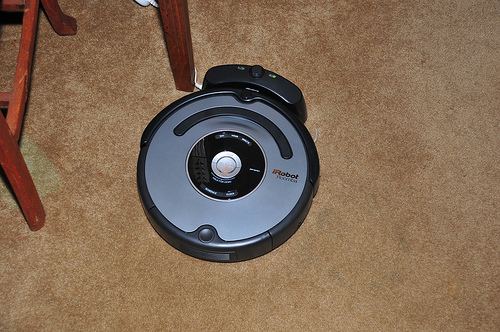 Other tasks are performed by means of an embedded computer that works together with the Roomba Open Interface. Roomba units are in the shape of a disc, measuring 13cm in diameter and 9cm in height. On the front half of the unit is a big contact-sensing mechanical bumper while on the top front center is an omnidirectional infrared sensor. Most of these robotic units are fitted with a recessed carrying handle. All Roomba models come with a pair of brushes that rotate in opposite directions when in operation. The Roomba vacuum runs on a removable NiMH battery that requires regular charging from a wall power adapter or through a self-charging home base. To use, the unit is carried into the room to be vacuumed and the clean mode button is typically pressed. Operating modes include clean mode, spot mode, max mode, and dock mode, depending on the model. Roomba vacuum cleaning robots come in a wide array of models and series, including the Original, 400 and Discovery, Professional and 500, 600,700, 800, and 900 series. Some Roomba models come with a feature called the AeroForce Cleaning System with Carpet Boost technology that enables superior cleaning power, especially on rugs and carpets. Some newer. Roomba models are built with an iRobot HOME app that allows users to set cleaning preferences from their smartphone, as well as an iAdapt 2.0 Navigation with Visual Localization system that expertly guides the robot around the room. Models are built to clean all floor types, including carpet, tile, hardwood and laminate. Different Roomba models require different parts and accessories. Side brushes, which wear off over time, will need to be purchased occasionally. These brushes can cost about $15 to $20 for a three pack. The same can be said with the filter. Just like your typical vacuum cleaner, these filters will cost about $25 to $35 for a three pack. A new battery may be required after every few hundred times. According to av8n.com, a battery will fail, even when one or two cells die. Plan on spending around $125 for a new battery. As for electricity, TreeHugger.com notes it will cost about $0.13 to run it every other day or $4.08 per year if it were charged and plugged in 24/7. When selecting accessories at the manufacturer website, you will first need to provide your unit’s series in order for you to find the accessories compatible with your vacuum cleaning robot. Roomba vacuum cleaning robots can be purchased at the following stores: Ace Vacuum, Army & Air Force Exchange Service, ABC Vacuum Warehouse, Abt Electronics, Ace Hardware, AimtoFind.com, Amazon, Bed Bath & Beyond, Best Buy, BJ’s Wholesale, Bloomingdale’s, Brandsmart, Frontgate, Coast Guard Exchange, Costco, Drugstore.com, Fry’s Electronics, GoVacuum, Hammacher Schlemmer, and, Harmony. Keep in mind that a Roomba will work differently when compared to an ordinary upright vacuum. For example, when vacuuming a dining room, you can simply remove the chairs or closely vacuum around them. This isn’t the case with a Roomba since it will bounce off the chair with its sensors, leaving some messes behind. On the flipside, this vacuum can reach many places an ordinary vacuum can’t reach such as under the bed. It takes about three to four hours to charge a Roomba. Sadly, the Roomba will not be able to climb and vacuum stairs. Receive special offers, coupons and rewards from the manufacturer by activating your robot’s warranty. You can register your Roomba vacuum at the iRobot online store. Battery replacements purchased from iRobot can be more expensive compared with third-party batteries. Find compatible battery replacements at reputable third-party battery suppliers. A used Roomba can save you more than 40 to 60%+. Check out eBay or Craigslist, for instance, to see what kind of deals you may find. Roomba is just one of the many brands available on the market. This BGR.com article, for instance, talked about a top-rated robot vacuum which only retailed for just $90.